The timeline on Trip captures all your activity on the site, recording your search terms and articles viewed. An extension of this is the ‘star’ feature. This allows you to highlight articles that you think are particularly ‘notable’. To ‘star’ an article you simply press the star to the left of a particular result (remember you should be logged in). In the image below (click to enlarge) you can see the stars higlighted next to each article. At any stage you can look back at your starred articles via a link at the top of the page called ‘Starred items’ (also highlighted). NOTE: This is a slight expansion of an earlier post (from 2012) but it’s an important feature we want to help users understand. RCT filter. It struck me, given their prominence in the ‘evidence based’ world, as strange that we didn’t have an RCT filter. So, why not have one and why not make it wonderful. So, we’re going to grab RCTs from multiple sources and hopefully launch with at least 500,000 RCTs making it one of the biggest RCT databases. Invariably the largest FREE RCT database. Better integration with PubMed Central, the full-text sibling of PubMed. Working with organisations to allow users to link to their institutions full-text collections. LMIC (Low and Middle Income Countries) filter. We’ve worked on this idea in the past but this takes a new approach. We’ll be using the LMIC filter highlighted by the Norwegian Satellite of the Cochrane Effective Practice and Organisation of Care Group (see here). It’s not validated but it needs to be put out there, tested and then – hopefully – improved upon. It should make the identification of evidence for LMICs much easier. DynaMed. This is not certain, but we’re hopeful, that users of DynaMed will be able to search Trip and see DynaMed content in their search results. Case Reports. Perhaps at the lower end of the evidence spectrum, we’ll be introducing case reports from the really interesting Cases Database. Low relevancy cut-off. A search in Trip returns ALL results that match a search query – even if the search term is only mentioned once in a ten thousand word document. I would consider that document as having low relevancy to the search. So, we’re going to remove all articles with a low relevancy score. Users, if they want can reintroduce them, can do so with minimal effort! Fingers crossed that testing goes well. Related to that is a brief survey we’re doing mainly around how to position the full-text offering. Six questions, five minutes. Please do it here. RCT filter. On Trip we have a systematic review filter but it’s a bit odd, given the prominence in the EBM world, that we have no RCT filter. However, in order to do this we have to build a decent collection of RCTs which we’re also having to do. 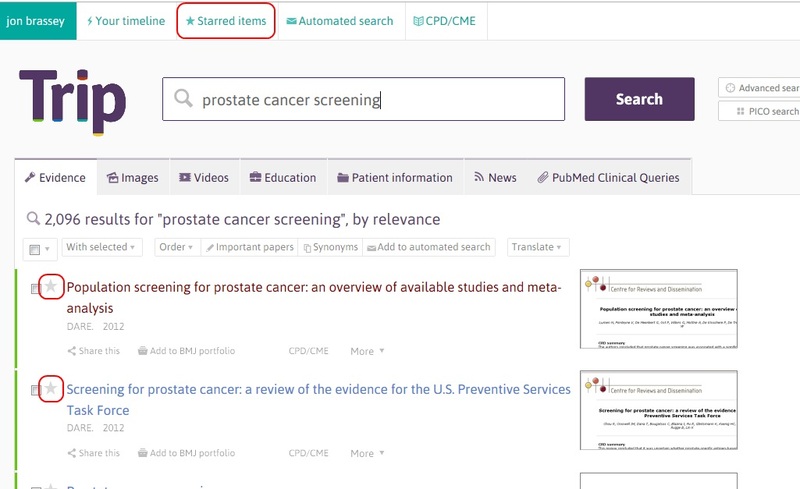 We’ll mostly grab content from PubMed but we’re also exploring other options/databases. We’re hoping to have at least 500,000 RCTs by the time we launch. PubMed Central (PMC) is a repository of full-text, freely available articles organised by the National Library of Medicine (who also supply PubMed). We currently link to PubMed for all our abstracts to primary research articles. So, we’re going to cross-reference our PubMed holdings with PMC and link to the full text on PMC (if it exists). Institutional holdings. Many users work in institutions that have paid for full-text. So, we will offer the ability for institutions to work with us to allow their users to seamlessly link with full-text articles the institution has purchased. LMIC. This stands for Low and Middle Income Countries and we want to add a specific filter to identify evidence suitable for such areas. Relevancy filter. A search in Trip returns ALL results that match a search query – even if the search term is only mentioned once in a ten thousand word document. We would consider that document as having low relevancy to the search. We will remove these low relevancy results. If there are lots of results (say over 100) we remove all results with very low relevancy. If we get over 250 results we remove all results with low relevancy. All this would be undoable (ie show all results) at the push of a button. Hopefully these will be released by the end of February.